If you need used motorhome parts, the best place to begin searching is the internet. No matter what the part is, some business or private seller will undoubtedly have the part you require to get you and your motorhome back on the road. Ebay is another place where you can find a wide variety of motorhome parts, whether it is for the mechanical aspect of your motorhome or for the living quarters. Since motorhomes spend a lot of time driven as well as stored, the average RV’er usually needs to purchase a number of parts during the course of maintaining the motorhome. Taking good care of the engine is especially vital since this is the component that gets used the most and is the most expensive to repair. Motorhomes are manufactured with either a gasoline or diesel fuel engine, each with their own pros and cons. Cheaper to fuel than diesel, gas-powered motorhomes will often require used motorhome parts before a diesel engine. This is because the demands on a gas engine are greater; cooling and heating issues typically cause the engine to wear out around the 80,000-mile range. However, if your motorhome is not on the road full-time, a gas-powered motorhome will last for many years. Diesel-fueled motorhomes, on the other hand, contain engines that can last up to 500,000 miles if properly maintained through regular oil changes and fluid checks as well as replacing old hoses. These motorhomes are also better equipped to handle larger loads and uphill travel without lagging. Diesel fuel is more expensive than gasoline so, if you are a full-time RVer, you are going to pay more in fuel but less in used motorhome parts. Motorhome parts can also include interior items such as furniture. Many full-time RVers love to change the decor of their traveling home and frequently sell used dinette sets, beds and other interior furnishings to fellow motorhome enthusiasts. Try searching for “used motorhome accessories at flea markets” or “traveling RV shows” so you have the opportunity to inspect an item before purchasing it. Buying less than new motorhome parts from a dealer or individual advertising on the internet is always a gamble; if possible, try to make purchases from sellers known to be reputable such as those recommended by fellow RVers. 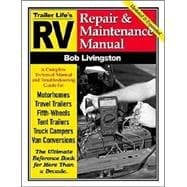 Internet sites like www.rvresources.com or www.rvbasics.com offer comprehensive lists of salvage companies dealing in used motorhome parts. Salvage "yards" are located all over the United States; since many specialize in hard to find parts, have no doubt one will have the part you need to repair your motorhome. For the price of the part and shipping costs, many companies will mail you the hard to find part if they have it. 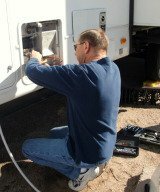 In addition to parts, salvage yards may also sell used motorhomes.